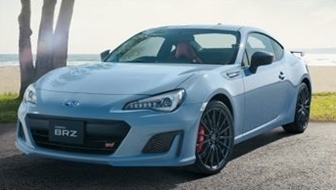 Tokyo, October 25, 2017 – Subaru Corporation today announced and began taking orders for the STI Sport, the new top of the Subaru BRZ lineup. The Subaru BRZ STI Sport is a joint development with Subaru’s motorsports subsidiary, Subaru Tecnica International (STI). *1 It is positioned as the top of the Subaru BRZ lineup, taking the driving performance and quality feel, as well as the luxury feeling of the interior and exterior, to new levels. Along with the sharp handling performance in direct response to the driver’s intentions, both outstanding driving stability and a luxuriously comfortable ride are achieved. To complement this high driving performance, exclusive refined interior and exterior fittings have been adopted, maximizing the Subaru BRZ appeal. The suspension system features flexible V-braces and flexible draw stiffener front suspension, developed with original STI technology. Exclusive 18-inch aluminum wheels and 18-inch high-performance tires are adopted. The use of SACHS dampers (made by ZF*2) and coil springs, specially tuned by STI, improves steering response and suppresses roll, achieving flexible but highly stable driving performance. The exterior, highlighted by an exclusive front bumper with STI ornament and an exclusive fender garnish, adopts glossy black components. The special styling emphasizes strength and virility befitting the superb driving performance. 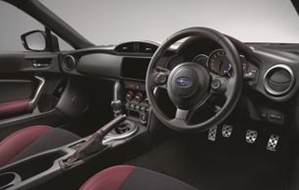 The color motif of the interior is specific to the STI Sport, featuring Bordeaux red coordination expressing the high quality and sportiness. Quality materials including real leather and Alcantara*3 are used for the seats. Exclusive components are adopted also for the instrument panel and its glare shield, and for the steering wheel, creating a sporty and special space. An STI Sport Cool Grey Khaki Edition is to be sold, with cool grey khaki body, limited to 100 units (sold by lottery). *2: SACHS is a brand of the renowned German automotive parts maker ZF Friedrichshafen AG. These parts are widely adopted in European cars because of their ability to deliver both comfort and performance. *3: Alcantara® is a registered trademark of Alcantara S.p.A.
*5: Grande Luxe® is a registered trademark of SEIREN Co., Ltd.
*6: Height includes roof antenna. The roof height is 1,285 mm. *2 Available as Cool Grey Khaki Edition, limited to 100 units.